E-Flite F-16 Thunderbird 70mm EDF PnP. BESTILLINGSVARE. The General Dynamics/Lockheed Martin F-16 is one of the most recognized and successful single-engine fighters in the world. Its amazing performance and capabilities are why the world-renowned U.S. Air Force Thunderbirds demonstration team chooses to operate it with distinction at airshows around the globe. 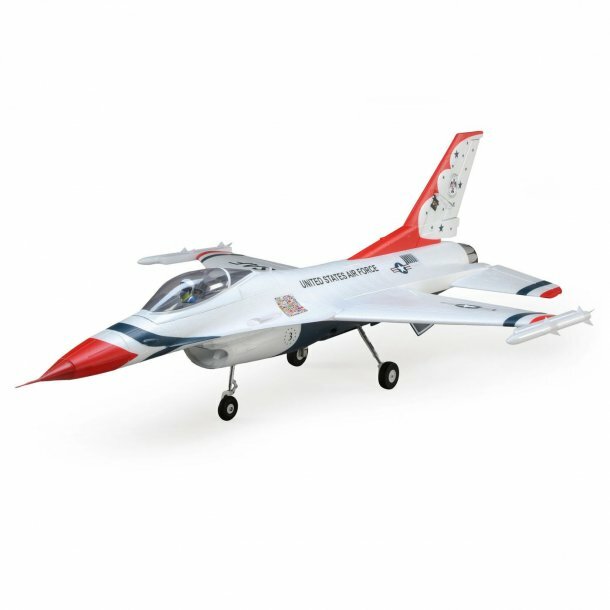 The E-flite® F-16 Thunderbirds 70mm EDF jet is a scale replica that delivers incredible performance while also being easy to fly when it’s equipped with exclusive AS3X® and SAFE® Select technologies (included with the BNF® Basic version only).